(q) Make available to the public, by means of access by way of the largest nonproprietary nonprofit cooperative public computer network, certain records of State agencies. As used in this subdivision (q), "State agencies" means all officers, boards, commissions and agencies created by the Constitution; all officers, departments, boards, commissions, agencies, institutions, authorities, universities, and bodies politic and corporate of the State; administrative units or corporate outgrowths of the State government which are created by or pursuant to statute, other than units of local government and their officers, school districts and boards of election commissioners; and all administrative units and corporate outgrowths of the above and as may be created by executive order of the Governor; however, "State agencies" does not include any agency, officer, or other entity of the judicial or legislative branch. As used in this subdivision (q), "records" means public records, as defined in the Freedom of Information Act, that are not exempt from inspection and copying under that Act. The State Librarian and each appropriate State agency shall specify the types and categories of records that shall be accessible through the public computer network and the types and categories of records that shall be inaccessible. Records currently held by a State agency and documents that are required to be provided to the Illinois State Library in accordance with Section 21 shall be provided to the Illinois State Library in an appropriate electronic format. The cost to each State agency of making records accessible through the public computer network or of providing records in an appropriate electronic format shall be considered in making determinations regarding accessibility. (Section 21) "Publications" means any document, report, directory, bibliography, rule, regulation, newsletter, pamphlet, brochure, periodical or other printed material paid for in whole or in part by funds appropriated by the General Assembly or issued at the request of a State agency, excepting however, correspondence, inter office memoranda, and confidential publications. "Published material" means publications in print and electronic formats duplicated by any means of duplication, including material downloaded from a publicly accessible electronic network. EDI is organized on a distributed model. This model recognizes that electronic access and preservation rely on an unbroken chain of support that begins with the digital object creator. EDI is founded on the principles of 1.) partnering with the creating agencies' staff members; 2.) encouraging dependable metadata; 3.) blocking viruses, worms, hackers and other security threats; 4.) providing online access by traditional bibliographic means as well as extensive search capabilities; and 5.) preserving the intellectual content, not merely the bit stream. The distributed model of EDI depends upon interagency cooperation, as the paper-based Illinois Documents Depository Program always has. However, EDI goes further. Because the creating agency understands content of its documents and files, and because only the creating agency can provide information required for long-term storage and retrieval concerning its publications, the agencies are expected to submit electronic digital objects with metadata. Digital object refers, in this context, to the electronic file or group of files that compose a digital copy of an Illinois document, whether that document is 'born digital' or digitized. Metadata, in this case, is information describing the objects being deposited for permanent public access. EDI is designed to accept digital objects created by a state organizational entity. ISL reserves the option of accepting files from other Illinois organizations. All digital objects deposited with EDI must be associated with metadata as required by the library's Metadata Generator for long-term management and user retrieval. EDI employs metadata derivative of the State GILS metadata set. The State GILS metadata schema is based on the federal Government Information Locator System. All persons using the depository tools for uploading digital objects into EDI must be authorized by ISL. EDI tools will not be designed for public retrieval of any deposited digital objects that have copyright restrictions noted in the associated metadata. Confidential information should not be deposited with EDI. Confidentiality cannot be guaranteed. Checksums or a similar technology will verify that deposited objects have not been altered. EDI management is alerted if any file is modified so that it can be restored to its original state from backup copies. Off-site data backup copies will be maintained to ensure disaster recovery. Deposited objects are assigned URLs (Universal Resource Locators) that will remain constant despite hardware, software or administrative changes. ISL will consult with agencies and provide guidance concerning disposition of digital object considered ephemeral, meaning not of sufficient historical or legal significance to justify the expense of long-term preservation and public access. 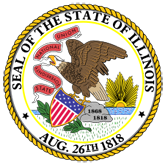 All digital objects deposited with EDI are the property of the State of Illinois.